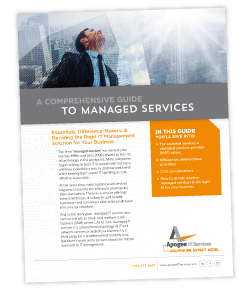 From proactive services to security, reactive support, and IT strategy, dive into 10 pages covering the 4 pillars of effective IT management. Our What: We are experts in technology, it is in our DNA and our IT solutions are always business enabling. Our Why: Our people are passionate about delivering the ultimate client experience and they feel fulfilled when they make a positive impact on someone’s day. We hope we can serve you and have a positive impact on your day and business! Managed services doesn’t mean slapping on a few tools and hoping for the best. When you’re searching for an MSP, choose one that will onboard you correctly. Have 65+ experts ready to go to work for you. Document your network thoroughly. Eliminate your daily IT frustrations and manage your vendors. And do whatever it takes to resolve issues. There was a flood in Pittsburgh. All electrical power cut out, including the servers & elevators in the building. Our technologists went in on the weekend. Up 23 flights of stairs. Loaded the servers. Down 23 flights of stairs. And hooked them up to a temporary space. They were back up and running that same day. They have been Apogee clients for 20+ years.